March | 2014 | Donna H.
This post comes on the back of a cake filled afternoon for a friend’s birthday which has now, understandably, led my friends to discuss how sick they feel from all the sugar (those were some big cakes!). Now they have every right to express their sugar induced nausea and this is no insult to them whatsoever. But their pancreases have got their backs and they’ll be just fine! As for us type 1s, when we’re hyper it’s a different matter. People without diabetes get sugar highs and I think sometimes people think the word hyperglycemia shortened to ‘hyper’ means just that. Unfortunately it’s a much different matter. Being hyper brings on a thirst that I genuinely believe no healthy person living in the Western world can understand. A Saharan desert style thirst. This happens because your body tries to get you to pee out all the sugar. Your lips stick together and to your gums and nothing seems to quench that thirst. High blood sugar can lead to serious nausea and even vomiting. It also gives you a headache and sometimes blurred vision. It makes you insanely tired and unable to concentrate. Not very good for uni work. Especially if it’s a common occurrence like mine. High blood sugar can also lead on to diabetic ketoacidosis (DKA), something which I was hospitalised with a couple of years ago and will probably write about in the future. So those are your short term symptoms, but in the long term it’s much worse. Long term high blood sugars can lead to retinopathy, blindness, kidney failure, neuropathy, foot and leg amputations (don’t Google diabetic foot if you don’t want to be sick! ), heart problems, strokes…. High blood sugar can come about from eating sugary things/carbs without enough insulin to cover it, missing an injection, miscalculating insulin doses, problems with injections sights, illness, stress, hormones etc. So now, hopefully if you’re not diabetic, you know a bit more about hyperglycemia and if you are I’d love to hear if you have any ‘strange’ symptoms too like the heightened senses or is that really just me?? 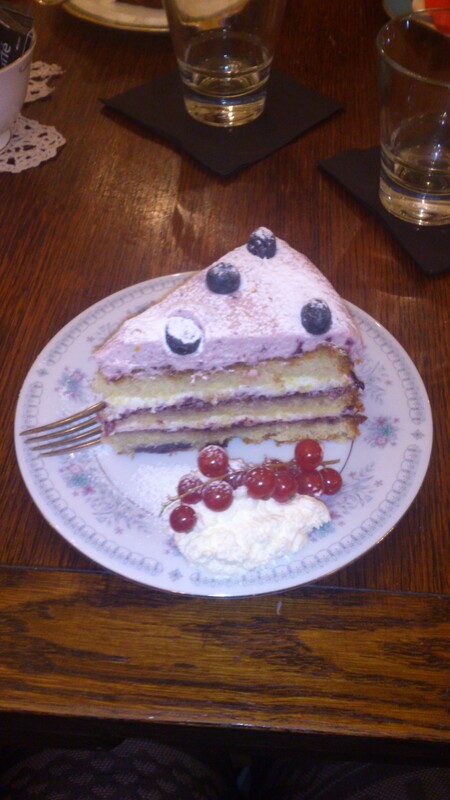 Now on a brighter note, back to today’s cake date. It was my friend Toria’s 22nd birthday so Rosemary, Cate, Anna and I went to see the Book Thief at the cinema which I enjoyed but is apparently nothing compared to the book. 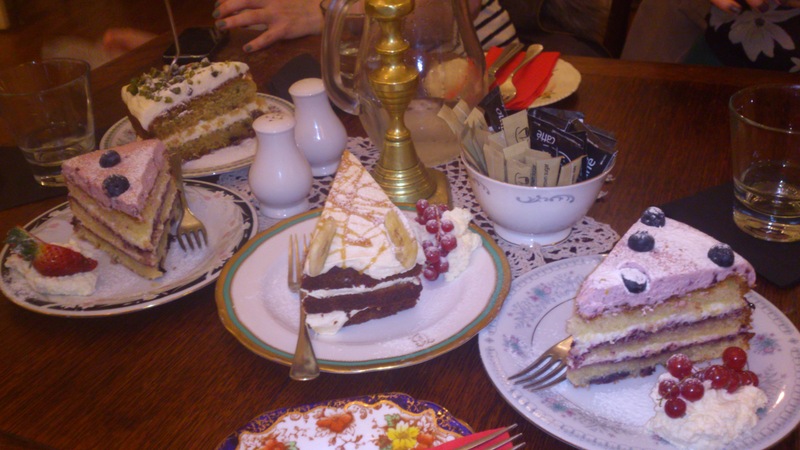 We then met Toria for delicious tea and cake at the Butterfly and the Pig’s tea rooms and gave her our gifts. My idea when starting this blog was to write a lot about diabetes but also have posts about general things like holidays I’ve been on etc, in an aim to get non diabetics reading. That’s one thing I think is missing from the world of diabetes blogging – blogs which reach people with and without diabetes. I can read diabetes blogs for hours and hours taking in every word, feeling grateful other people feel the same way as me, understanding what people are going through and comparing my experiences to theirs. But would my friends read them with the same interest? I doubt it. Trying to get people without diabetes to have any empathy for diabetes is something I see as a huge problem. I don’t understand what it is about things like cancer that is so emotive for most people, that just doesn’t work with diabetes. Let me know if you have any views on this, even if they sound offensive! Anyway for now the aim is to do more diabetes posts anyway, as they are much harder to write than posts with photos of what I’ve been up to. This has meant that 90% of the posts I do are posts like those, with only about 10% diabetes, which is never what I wanted this to be. So I’m planning to do a few posts called “What it feels like to…” on being hypo, hyper, injecting, going to clinics, carbohydrate counting etc etc.